I can’t believe it has been five months since we started our baby led weaning journey. What a passage it has been. We started with lots of soft foods back in November, mainly pancakes and muffins, offering one meal a day before building it up to where we are today. Dexter now eats three meals, two snacks and will consume anything that is put in front of him. For breakfast he has a crumpet or a piece of toast smeared with peanut butter and a banana. For lunch we eat omelettes jam packed with chicken, veg, cheese, herbs and spices. For dinner he has whatever is on the meal plan. Last night for example we had pasta with chorizo and cod cooked in a tomato and red wine sauce with basil, chilli flakes and paprika. Tonight we will have a pork roast with potatoes, numerous vegetables and Yorkshire puddings. It should never have been a surprise to me that he will attempt to eat anything. After all, everything he touches goes into his mouth for him to explore. There have been certain things he has spat out and seemed to refuse, but I always continue to offer them and eventually he decides he likes them. His favourite type of food has to be fruit. He devours bananas, blueberries, oranges and grapes like there’s no tomorrow. I love going for a wander in Tesco and picking up the free clementines for him to eat in the trolley as we meander the aisles. Our biggest challenge of the journey has got to be the mess. We have ruined so many vests, t-shirts and pants and spent many hours scrubbing the floor and highchair. Thanks to the BIBaDO, stains and mess are now very rare. We have a system in place to minimise the mess using the BIBaDO and a catch all bib. I know choking is a big concern to many parents, but touch wood, we have never experienced a choking episode here. There has been plenty of gagging, especially in the first two weeks and that can be scary. 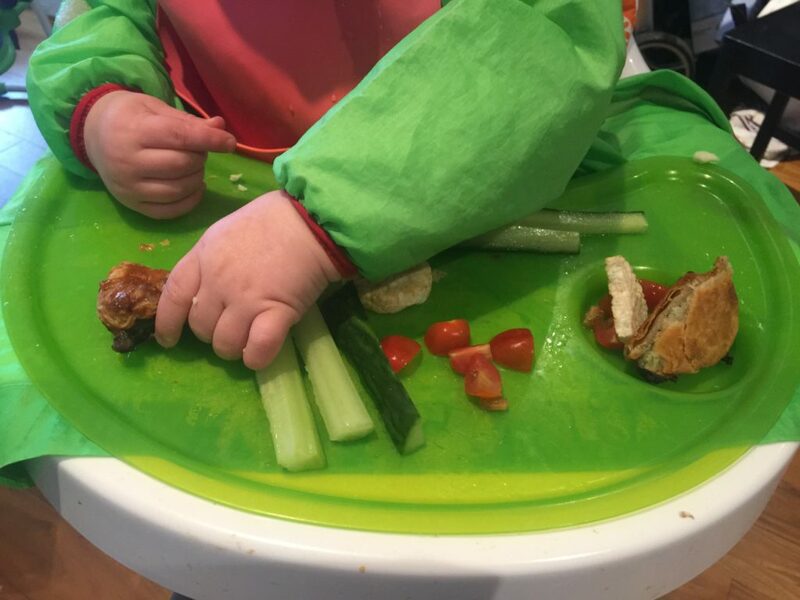 As a mum who is new to baby led weaning, it is important that you understand that gagging is normal and will help the baby to learn to chew food into smaller pieces and not let it fall to the back of his mouth. Gagging should ease after a few weeks and it is very rare Dex gags now, although it does happen from time to time. After a month or two of offering big pieces of finger foods, I realise that Dex had learnt how to take chunks out of food using his teeth and gums. This was fine for soft things like bananas, but concerned me when it came to things like cucumber. Again, I needn’t have worried. Through baby led weaning, Dex has learnt that he needs to spit out big chunks that he is unable to chew. Even so, with things like chicken, I cut it into small chunks so he is able to eat them instead of spitting them out. Once I have put his evening meal in a bowl, I go at it with a pair of scissor to cut things like hard veg and meat into small chunks so they are easier to consume. Dex loves using his pincer grip to pick these chunks up as well. We have started to introduce cutlery but it is very hit and miss. I got a great tip from a fellow baby led weaner about putting the fork/spoon in the bowl and congratulating and praising when baby takes it out to put in his mouth. Most of the time, Dex is putting the cutlery in his mouth the wrong way and he doesn’t yet know how to put the spoon back to get more food. But, as with everything, it takes time and a lot of patience and we will keep practising. His milk intake has really dropped down. He is only having two or three bottles a day and not much from them at all. I make sure I offer lots of cheese and yoghurt and use milk in my cooking where necessary. Dex continues to put on weight, so I am not worried about his milk consumption. If you could see how much he was eating, I am sure you wouldn’t be worried either. I offer water at every meal time in a basic Tommee Tippee sippy cup. Dex knows exactly how to get water out and has fun drinking it and also spitting a lot of it out. I have no idea how much he is actually drinking, but I trust him to lead the way. He is able to reach out to the cup to let me know he wants it and when he starts messing about with it, I take it away. I am so glad we embarked on this journey together. It’s been fantastic to be able to give him the food that we eat and makes life so much easier when we are eating out. He does drop a lot of bits on the floor, but with time that will get better as his coordination improves. 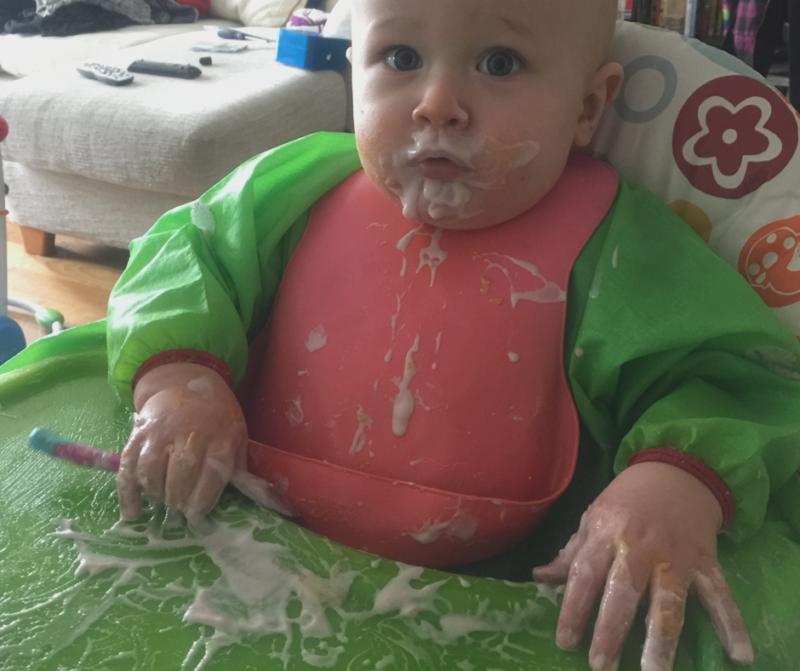 Are you thinking about baby led weaning? Or are you already doing a baby led weaning journey? How’s it going? What are your concerns? For more weaning wisdom, check out my guest series Weaning Wisdom Wednesdays. 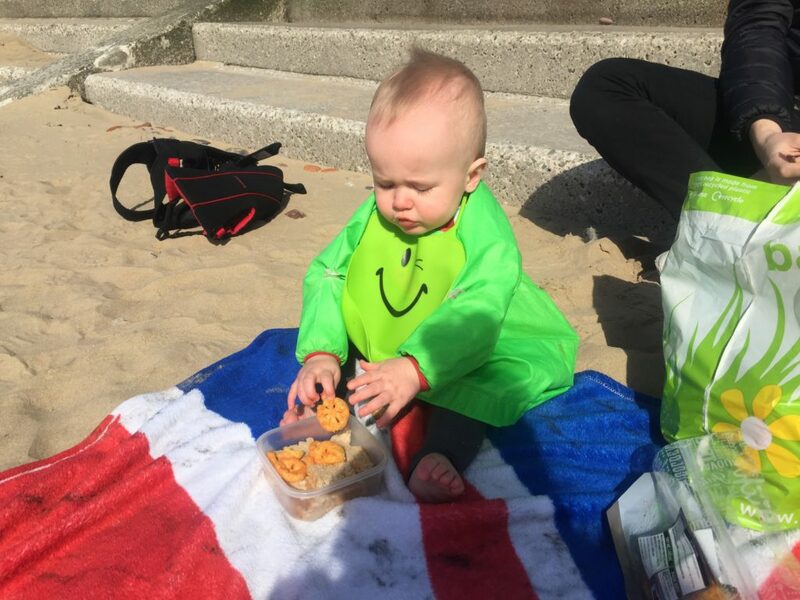 I love that photo of Dex on the beach with his bib on! You’ve both done so well with baby led weaning, no wonder he’s dropping milk when he’s eating so well, he’s clearly growing and is happy and healthy! Great tip on the cutlery, I think we will start trying something similar at some point, although I’m not sure I can cope with more weapons for him to chuck on the floor! We have just started BLW. She is exploring but still doesn’t consume much yet. She is a booby monster so I’m not worried. It’s just fun for both of us at the moment. That’s fantastic. Dex took to food straight away and always ate more than he threw on the floor. We’ve been very lucky. I am glad she is still boobin! Good luck with your journey. It’s amazing.